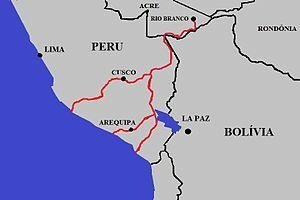 The Interoceanic Highway or Trans-oceanic highway is an international, transcontinental highway in Peru and Brazil to connect the two countries . The east-west passageway spans 2600 kilometers. From Peru's Pacific ocean coastline, it continues across the Andes mountains and through a large part of the Amazon rainforest in the Peruvian department of Madre de Dios. It then travels into Brazil where it connects with a network of existing highways to the Atlantic. It entailed the renovation and construction of roughly 2,600 kilometers of roads and 22 bridges. Now completed, it creates a connected highway from the Peruvian ports of San Juan de Marcona to Brazilian ports and cities throughout the City of Rio Branco ZPE (Special Export Zone). The project came into being via a 2004 agreement between Alejandro Toledo and Luiz Inácio Lula da Silva, then presidents of the two countries. In Peru the project is known by the MTC (Ministerio de Transportes y Comunicaciones) as the Corredor Vial Interoceánico Sur Perú-Brasil and by ProInversion (Private Investment Promotion Agency - Peru) as the Initiative for the Integration of the Regional Infrastructure of South America, (Iniciativa para la Integración de la Infraestructura Regional Suramericana) (IIRSA), SUR axis. The project is part of a national road investment plan which involves the construction of three longitudinal highways, and 20 transversal highways. Parts of these transversal highways make up part of IIRSA SUR. In June 2005, the second, third, and fourth sections were leased to specialized Peruvian and Brazilian consortia of private companies for 25 years, in which they will be responsible for looking after the highway, the built and forthcoming bridges, and tollbooths. The first and the last section were leased in 2007. 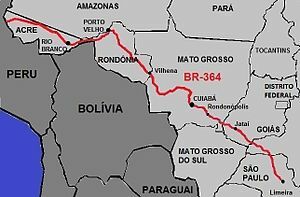 The Brazilian section runs from the border town of Assis Brasil via BR-317 into the main Brazilian road network through Porto Velho and Cuiabá via BR-364. The total project has an estimated cost of US$1.3 billion, but some analysts predict a higher cost. Of this, about US $810 million is for stretches 2 - 4, $199 million is for stretches 1 and 5, and the remainder for bridges, urban connections, and overhead. The project employed about 6,000 people during construction. It was inaugurated by Peruvian President Garcia in August 2011 and is now officially complete and operational. However, as of July 2013 some of its bridges across the Madeira River were still not constructed and parts of the rest of the road were not properly built to support truck traffic that would be needed for exporting goods overseas as originally conceived. Two branches of the Interoceanic Highway cross the main Andean watershed. The Urcos - Inambari branch crosses the watershed approximately here, about 7 km (in a straight line) north-east of Urcos (the road distance is much longer). The Azangaro - Inambari branch crosses the watershed approximately here, about 85 km north of Azangaro. Several non-governmental organizations have expressed concern that the project was approved with atypically little effort on Environmental Impact Studies. Concerns are both environmental (such as deforestation, illegal hunting and fishing, soil erosion, loss of biodiversity, or loss of ecotourism value), and social (such as harm to indigenous populations, illegal crops, drug and arms trafficking, "slaving underemployment", or prostitution). There is an intention to build another route between Paita and Yurimaguas, both in Peru, to give river access to the Amazon and Brazil. Rapp, Kenn (2005-12-30). "The Brazil-Peru Trans-Oceanic Highway: Project Summary". BICECA: Building Informed Civic Engagement for Conservation in the Andes-Amazon. Bank Information Center. Archived from the original on 2011-09-05. Retrieved 2006-08-31. "Southern Interoceanic Highway (Peru-Brazil)". BIC - Bank Information Center. Archived from the original on December 26, 2010. Retrieved 2011-01-29. ^ "Southern Interoceanic Highway (Peru-Brazil)". BIC - Bank Information Center. Archived from the original on December 26, 2010. Retrieved 2011-01-29. ^ "Home page > Sector > Infrastructure > Transport". PROINVERSION - Private Investment Promotion Agency - Peru. Archived from the original on 2013-04-16. Retrieved 2011-01-29. ^ "Inicio MTC > Concesiones en transportes > Concesiones otorgadas > CORREDOR VIAL INTEROCEÁNICO SUR: TRAMOS 2, 3 Y 4". Ministerio de Transportes y Comunicaciones – MTC. Retrieved 2011-01-29. ^ "Inicio MTC > Concesiones en transportes > Concesiones otorgadas > CORREDOR VIAL INTEROCEÁNICO SUR: TRAMOS 1 Y 5". Ministerio de Transportes y Comunicaciones – MTC. Retrieved 2011-01-29. ^ Roberts, Mhairi (3 August 2011). "Interoceanic Highway – Road to Ruin?". Argentina Independent. ^ Reel, Monte (19 February 2014). "Traveling From Ocean to Ocean Across South America". New York Times. ^ Collyns, Dan; Phillips, Tom (14 July 2011). "Pacific-Atlantic route drives up fears of crime and destruction". The Guardian. This page was last edited on 12 March 2019, at 18:22 (UTC).